Custom Probiotics has formulated a D-Lactate Free Probiotic powder formulation that has been used most specifically for autistic children. 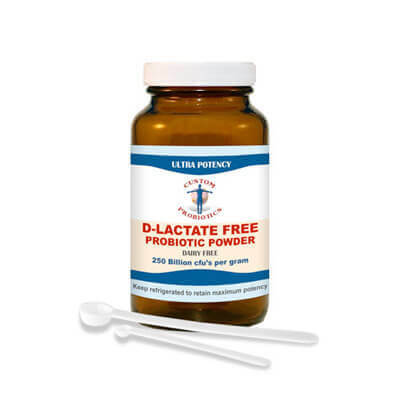 D-Lactate is a by-product of probiotic fermentation that may produce neurological problems. Custom Probiotics D-Lactate Free Probiotic powder formulation is very high in potency at 250 billion cfu's per gram. It contains L. Salivarius, L. Rhamnosus, B. Bifidum and B. Infantis. It is dairy free, hypoallergenic and does not contain any artificial colours, flavours, sugar, gluten, soy or FOS. A few thousand autistic children worldwide have used this D-Lactate Free formulation successfully. We have seen from moderate to dramatic improvement in their conditions ranging from formed stools, reduction of diarrhea or constipation, yeast or Candida control, intestinal flora and food allergy improvement, amelioration of skin conditions, more relaxed and less agitated conditions, better concentration, behaviour, language, eye contact and speech. The fundamental cause of autism, based on Custom Probiotics’ experience, is severe intestinal flora imbalances resulting in immune dysfunction. Factors that can have detrimental effect on the intestinal microflora of a child can also have negative effects on their immune system and health. A toxic intestinal microflora loaded with pathogenic bacteria and yeast will have direct effect on the whole body including the brain. Antibiotics, various drugs, vaccinations and a somewhat lower immune system will negatively affect the intestinal flora of a child, creating a favourable environment for colonization by opportunistic pathogens. Custom Probiotics has a unique D-Lactate Free Probiotic powder formulated to be specifically helpful for children with Autism Spectrum Disorder (ASD), by improving their intestinal microflora and digestive processes.D-lactate is a result of fermentation of probiotic bacteria in the digestive system. An excess of D-lactate in the system can produce digestive and neurological problems. L. Plantarum and L. Acidophilus produce high D-lactate and therefore we do not include them in our D-lactate free formula. As a result, a simultaneous reduction of immune, mental and behavioural capabilities become evident in the child. Probiotics thus play an important role in helping autistic children by tackling the neurotoxins and pathogenic bacteria and yeast in the gut. Probiotics are the most natural way to help normalize the intestinal microflora. It is essential that probiotics be used prior, during and after any intervention that affect the flora negatively especially during the first three years of life. A sugar, gluten and casein free diet is also very important for improving the intestinal flora, resulting in improvements in symptoms of autistic children. To conclude, whilst it will not cure autism, modifications of gut flora function using probotics can improve symptoms to various extents. 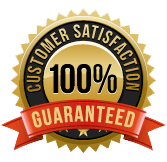 This D-Lactate Free Probiotic formulation has been very successful in this respect. It has been used by Health Care Professionals and parents of Autistic children around the world for the past 8 years.